I know what you’re thinking. “Did my regex block six XSS attacks or five?” You’ve got to ask yourself one question: “Do I feel lucky?” Well, do ya, punk? Maybe you read a few HTML injection (cross-site scripting) tutorials and think a regex solves this problem. Maybe. Let’s revisit that thinking. We’ll need an attack vector. It could be a URL parameter, form field, header, or any other part of an HTTP request. Many web apps implement a search functionality. 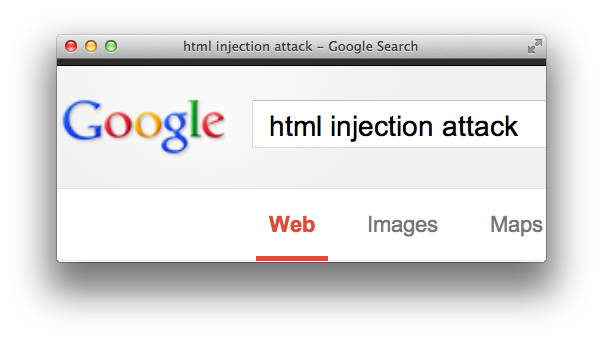 That’s an ideal attack vector because the nature of a search box is to accept an arbitrary string, then display the search term along with any relevant results. It’s the display, or reflection, of the search term that often leads to HTML injection. 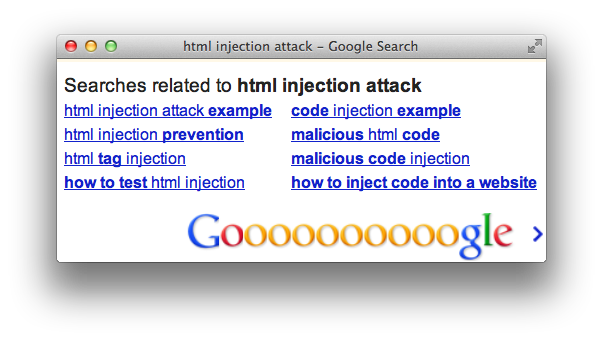 For example, the following screenshot shows how Google reflects the search term “html injection attack” at the bottom of its results page. And the text node created in the HTML source. 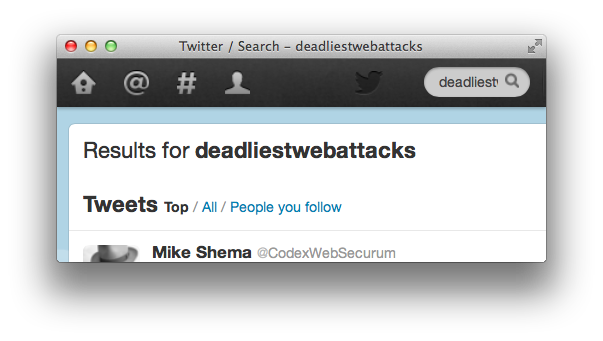 Here’s another example that shows how Twitter reflects the search term “deadliestwebattacks” in its results page. And the text node created in the HTML source. Let’s take a look at another site with a search box. Don’t worry about the text (it’s a Turkish site, the words are basically “search” and “results”). First, we try a search term, “foo”, to check if the site echoes the term into the response’s HTML. Success! It appears in two places: a title attribute and a text node. Next, we probe the page for tell-tale validation and output encoding weaknesses that indicate the potential for this vulnerability to be present. In this case, we’ll try a fake HTML tag, “<foo/>”. The “<foo/>” term isn’t displayed because the browser interprets it as a tag. It creates a DOM node of <foo> as opposed to placing a literal “<foo/>” into the text node between <a> and </a>. 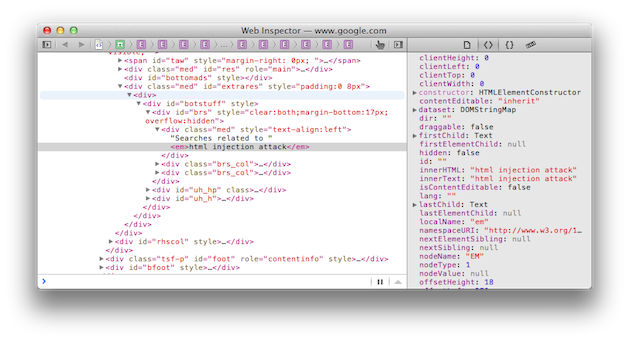 The site’s developers seem to be aware of the risk of writing raw “<script>” elements into search results. In the title attribute, they replaced the angle brackets with HTML entities and replaced “script” with “[removed]”. So, let’s modify out payload a bit. We condense it to a format that remains valid (i.e. a browser interprets it and it doesn’t violate the HTML spec). This step just demonstrates an alternate syntax with the same semantic meaning. Unfortunately, the site stripped the onerror function the same way it did for the <script> tag. Additional testing indicates the site apparently does this for any of the onfoo event handlers. We’re not defeated yet. The fact that the site is looking for malicious content implies that it’s relying on regular expressions to blacklist common attacks. Oh, how I love regexes. I love writing them, optimizing them, and breaking them. Regexes excel at pattern matching, but fail miserably at parsing. And parsing is fundamental to working with HTML. Look what happens to the site. We’ve successfully injected an <img> tag. The browser parses the element, but it fails to load the image called “x>” so it triggers the error handler, which pops up a friendly alert. Why does this happen? I don’t have first-hand knowledge of the specific regex, but I can guess at its intention. HTML tags start with the < character, followed by an alpha character, followed by zero or more attributes (with tokenization properties that create things name/value pairs), and close with the > character. It’s likely the regex was only searching for “on…” handlers within the context of an element, i.e. between < and > (the start and end tokens). A > character inside an attribute value doesn’t close the element. The browser’s parsing model understood the quoted string was a value token. It correctly handled the state transitions between element start, element name, attribute name, attribute value, and so on. The parser consumed each character and interpreted it based on the context of its current state. The site’s poorly-formed regex didn’t create a sophisticated enough state machine to handle the “x>” properly. (Regexes have their own internal state machines for pattern matching. I’m referring to the pattern’s implied state machine for HTML.) It looked for a start token, then switched to consuming characters until it found an event handler or encountered an end token — ignoring the possible interim states associated with tokenization based on spaces, attributes, or invalid markup. This was only a small step into the realm of HTML injection. For example, the web site reflected the payload on the immediate response to the attack’s request. In other scenarios the site might hold on to the payload and insert it into a different page. It’s still reflected by the site, but not on the immediate response. That would make it a persistent type of vuln because the attacker does not have to re-inject the payload each time the affected page is viewed. 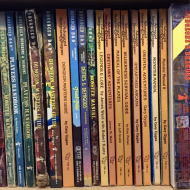 For example, lots of sites have phrases like, “Welcome back, Mike!”, where they print your first name at the top of each page. 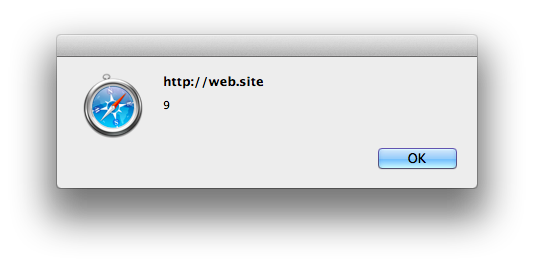 If you told the site your name was “<script>alert(9)</script>”, then you’d have a persistent HTML injection exploit. When user-supplied data is placed in a web page, encode it for the appropriate context. For example, use percent-encoding (e.g. < becomes %3c) for an href attribute; use HTML entities (e.g. < becomes &lt;) for text nodes. Prefer inclusion lists (match what you expect) to exclusion lists (predict what you think should be blocked). Work with a consistent character encoding. Unpredictable transcoding between character sets makes it harder to ensure validation filters treat strings correctly. Prefer parsing to pattern matching. 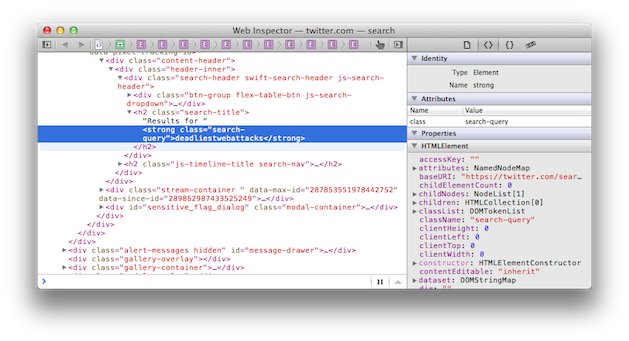 However, pre-HTML5 parsing has its own pitfalls, such as browsers’ inconsistent handling of whitespace within tag names. HTML5 codified explicit rules for acceptable markup. If you use regexes, test them thoroughly. Sometimes a “dumb” regex is better than a “smart” one. In this case, a dumb regex would have just looked for any occurrence of “onerror” and rejected it. Prefer to reject invalid input rather than massage it into something valid. This avoids a cuckoo-like attack where a single-pass filter would remove any occurrence of the word “script” from a payload like “<scrscriptipt>”, unintentionally creating a <script> tag. Prefer to reject invalid character code points (and unexpected encoding) rather than substitute or strip characters. This prevents attacks like null-byte insertion, e.g. stripping null from &lgt;%00script> after performing the validation check, overlong UTF-8 encoding, e.g. %c0%bcscript%c0%bd, or Unicode encoding (when expecting UTF-8), e.g. %u003cscript%u003e. Make sure to escape metacharacters correctly. For more examples of payloads that target different HTML contexts or employ different anti-regex techniques, check out the HTML Injection Quick Reference (HIQR). In particular, experiment with different payloads from the “Anti-regex patterns” at the bottom of Table 2.